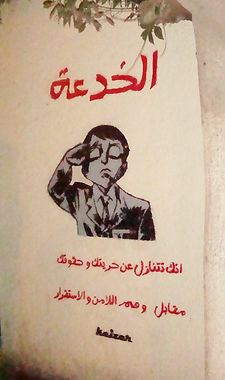 On January 25, 2011 as people in Cairo were coming to the streets flowing towards Midan Tahrir demanding the overthrow of Egyptian President Hosni Mubarak; ants started appearing crawling on the walls of the capital becoming – soon – a colony representing “the forgotten ones, the working class, the oppressed and the faceless victimized by capitalism”. The graffiti scene barely existed before the revolution which toppled President Hosni Mubarak. However, the uprisings and the consequent fall of teh hierarchical structure promoted a libertarian dimension from which a powerful creative, cultural and ideological stream was released in teh whole country. The artistic wave often shattered unapologetically on Cairo’s wall which served as canvases where political requests, martyrs, hopes were depicted allowing any passerby to retrace the historical events and pathos. Artists transformed the walls in a political tool against the tyranny. In time, there have been repeated attempts to censor such freedom of expression by whitening the walls, only to find out that overnight a new artwork appeared – even more impertinent. The process of reappropriation and self-management of the urban spaces was by then set. 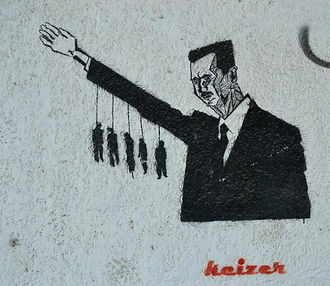 Keizer was – and still is- one of the most active street artists who have greatly contributed in making art accessible to everyone with the objective of triggering a widespread critical thinking against the establishment and the current corrupted big powers. In this interview he explains the roots of his dissent, the dialectic of his art and the daily struggle against a capitalistic system he doesn’t recognize as just. You started as a street artist during the very first days of the Egyptian revolution, in fact you were amongst the protestors in Midan Tahrir. You could have contributed in many ways to the uprising, when did you realize that street art could have been a powerful weapon and the most suitable to your dialectic? First of all the greatest contribution any person can give to a revolution, is presence. Holding your ground, and being physically there until the death of the system occurs and the birth of a new one emerges. The countrymen and women I marched with on the 25th of Jan were the greatest and purest of the land, their contributions can’t be downplayed or forgotten by time. Especially those that paid the ultimate price and those that still continue to suffer and die in the name of truth and freedom. Since I’ve always had a bad relationship with authority and capitalism, I decided to take matters in my own hand, and the revolution was more than a convenient landscape for taking action which in my case was subversive socio political art. Street Art is undeniably the most powerful artistic medium in the world. This is due to it being uncensored, unregulated and it doesn’t abide to political correctness nor does it need the approval of institutions. This drives governments crazy, because in essence street art is the occupation of what the government considers unapproved advertisement space and to make things worse for them there’s nearly always an antiestablishment sentiment that questions and exposes the powers that be. Who are your inspirers in art, music and literature and how did they influence your artistic language? Was street art practiced and conceived differently before the Revolution? I had seen two pieces that I had come across before the revolution. They were there for years. They were symbolic figures, that didn’t make sense to me in terms of the message. Then again art doesn’t have to make sense to me or to anyone for that matter. I think that’s what some of us like about art. You often depict ants on the walls of Cairo. Could you please explain us the hidden meaning of such representation? The ants are the forgotten ones, the silenced, the faceless, those marginalized, degraded, victimized by capitalism ,the disacknowledged and the nameless who have died over the centuries in wars, genocides and ethnic cleansing. Those whose graves have numbers instead of letters. They are the working class, the common people, good hard working humans wanting to make ends meet when the connection has been already been severed by the greed and gore of industry. Unrecognized and unseen by the over privileged, they support and carry the elites on their back making it possible for them to maintain their lifestyles, at the same time making our slightest comforts possible. Ants are devoted, dedicated workers ,they cooperate, organize, delegate, and put themselves first in the line of danger and duty. They are the colony that struggles and sacrifices blindly for the queen ant and her monarchy. Under appreciated and ruled, they receive and expect no reward for their efforts, toil and struggle. 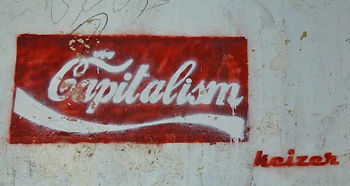 Talking about capitalism, in your street art you use images belonging to the American culture or to the consumerism culture and you distort them as a mean to address certain issues. Could you please tell us more about the message you want to convey? America perfected capitalism for its advantage and like most American things, capitalism was not built to last and we can clearly see the cracks as well as feel the side effects of the way it has changed people’s attitude and behaviour towards the planet and each other. Such a greed oriented ethos and mind set shows how these governments and corporations have chosen to represent and conduct themselves without regards to human dignity nor to sovereignty. I believe this system will deplete everything around it until it devours itself, and I look forward to that day, regardless of the circumstances. In the meantime I’m trying to move the hearts and minds of those consciously or unconsciously participating in keeping this system alive. When clearly there’s no pulse or soul left in it. I do this by creating doubt, through questioning reality, the environment we live in and authority, magnifying the illusion and exposing the false promises these powers deem to guarantee cheap labour civilians globally. You’ve also tackled other social issues such as women, the Syrian revolution and the raise of the Muslim Brotherhood…could you tell us more? Its too late to consider art for women’s right as something special or unique. It’s been created for several decades, for different reasons and still continues. But the message is one: women are an integral part of life and society and I treat it as seriously as I do with the different themes I tackle in my pieces. The Muslim Brotherhood were a pawn and scapegoat in a big chess game of which they weren’t aware of. They were approved by the system in order to create the economic and political instability and lock down what later would have been the pretext for the 2013 Military Coup, which the country is still suffering from until the present day. Even though I never agreed with the Muslim brotherhood’s philosophy, and I have attacked them numerous times through street art. It’s pretty obvious now, that the powers at be, allowed them to be in charge of the country, betting on the Egyptian Islamic moderation and on the negative public opinion towards the brotherhood. The military knew it was a matter of time until the country would have disapproved the Brotherhood because of their secularist nature. The military also strategized and implemented an aggressive smear campaign against the brotherhood, by creating electricity black outs and increasing the gas’ price. It was a matter of time until the people begged for a saviour who was originally their oppressor. 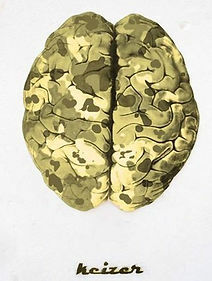 The military. It’s simple, you create the problem and wait for the people to come back to you, not realising that they are asking for help from those that created the problem in the first place. A classic false flag. Sadly, in such times, people are fearful and desperate and become willing to give in their freedoms and rights, demanding and agreeing on more security. They exchange freedom for the illusion of safety and progress. On the other hand the Syrian situation is devastating, and it causes me much strife and distress. The unnecessary squandering of life, the deformation of identity and culture is gut wrenching .The situation in Syria seems to always be portrayed as layered, confusing and complicated. It is, but I like to break things down to basics. All I can say is that as Arabs, we need Syria, it is probably the last Eastern frontier of the Middle East. If it goes down we all go down like dominoes. I don’t care who’s running Syria tomorrow or in 10 years as long as it remains Syrian without foreign sanctions, infiltrations and intervention from Western forces which always have a self-invested interest in the areas resources and the world at large. It appears strikingly clear from your art that you are an unapologetic and politicized artist, do you reckon that your graffiti have contributed to raise awareness and criticism against the establishment amongst the Egyptian People? Yes, If anybody needs to apologize, it’s the world’s governments and not the other way round. We are innocent from their atrocities and deceptions. I’d like to think I have helped in making a difference and raising awareness, but that’s something quite hard to quantify. Unfortunately the Egyptian political system has systematically degraded, demoralized and oppressed Egyptians throughout the centuries, to the extent that they have turned over time into demotivated apathetic observers. 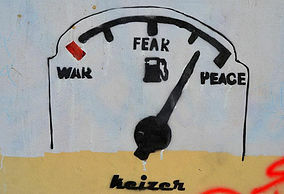 Even idealistic street art messages nowadays are seen as utopian tacky clichés due to how low self-esteem and morale is. I don’t pay much attention on how the message affects people, rather my focus is on the message. Some understand the risk I take and the cause behind it, and some just see it as internet entertainment. Which is fair. 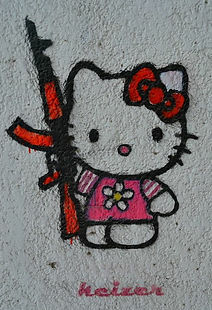 In what environment is the underground art movement and the non-mainstream media operating years later the revolution? Is it becoming more challenging under the military government and in what way? 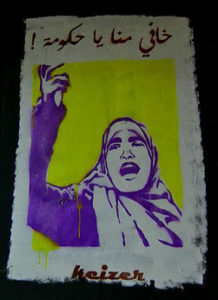 I’m not connected to the underground art scene in general, I have never personally met a fellow Egyptian street artist. I work on my own because I’m a believer in individualism and that everyone represents themselves through their unique voice. With that being said I still believe collaborations are positive, healthy and sometimes they bring out beautiful results, sometimes they don’t. I happen to be lucky that I have a lot of ides and feelings about the world. I’m constantly busy contemplating, drawing and executing concepts. The ideas keep coming through and they are more than I can apply for the moment. I hope I have enough time here to bring all or most of them out. I’m aware that lots of European funding for Egyptians artists and cultural centres has decreased in the past few years. I never personally sought out for foreign money to create art in my country, so my motivation and drive was never influenced by the availability of funds or lack of it. I feel it’s a dangerous thing to depend on funding as an artist. Everything is being challenged by the Military, at this stage, the best thing to do is not to get caught. Seriously the risk and punishment are graver than anyone can handle at this stage. Street art by definition is accessible to everyone and exposed in public spaces, were you initially afraid to denaturalise your art by exposing it in closed spaces such as museums or art galleries? Or it’s a matter of choosing the right venues and channels? No, I wasn’t ever hesitant about showing my art in closed spaces. When ideas are impactful it doesn’t matter where it’s shown. Any powerful, truthful, thought provoking or catchy message, transcends the time and environment it is being shown in, even the streets. Then again, people forget artists are people too, we have chosen this path to make a living and have bills to pay as well, and some even have kids to feed. In order to continue to do what I love I have to sell some of my art, in order to keep producing art on the streets. When it comes to galleries, I have the upper hand. Being an antiestablishment artist, it makes sense that galleries work around you and not the other way. I choose the pieces I want to create and exhibit. Some galley owner’s don’t even know what I will exhibit, until the morning before the exhibition opening. I understand their frustrations, but at the same time I can’t compromise. Do you have the impression that the revolution is over or do you believe that the resentment and anger are still lingering there, just waiting for the right moment to erupt again? I believe Egyptians handed away the revolution with their own hands and deep down we know it. We had a golden opportunity that rarely comes and we blew it: we handed back our country happily to those that have always kept us under water. We have no one to blame but ourselves. To the extent that in the past few years most Egyptians are reminiscing over the Mubarak years, and how things were so much better and harmonious. Which makes it clear, it’s not about freedom or democracy. Sadly it’s about survival, self-interest and financial stability. It’s about the unbelievable recent rise in prices, the diminished levels of trade and the purchasing of power. Currently we are in a state of economic paralysis, so we are currently paying our dues. Finally, I know it’s a common questions, but what does Keizer mean? There are 3 types of bread in Egypt that we eat Shawerma with: Shami (Lebanese Bread) Faransawi ( Soft Loaf Bread) Keizer (Bread Buns). The idea behind the name is wanting to make art accessible to the masses just like the masses have access to the bread they depend on a daily basis.